1. Redemption period is from February 4, 2019 to March 15, 2019. 2. Stay Period is from February 13, 2019 to April 15, 2019 (Black-out dates are February 23 and 24). 1. Requests for redemption of Miles must be filed with Mabuhay Miles Service Center (MMSC). Members may visit Mabuhay Miles Service Center or call 855 8888. 2. 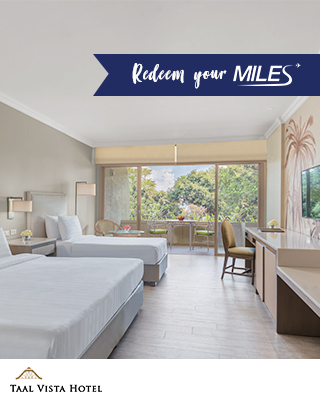 Members must provide their Mabuhay Miles membership number, mobile number and email address upon redemption. 3. A confirmation message (via email) shall be sent by Mabuhay Miles to Members within 24 hours after redemption. 4. Members may call TVH at (02)9178225 for room reservations within 7 days from the date of redemption. 6. Redeemed Miles can no longer be reverted back to member’s Mabuhay Miles account. 7. The room stay packaged redeemed are non-convertible to cash. 8. This promotion cannot be availed in conjunction with other promotions or discount schemes. 9. Prior reservation is required and subject to availability. 10. Additional room/s or night/s will be settled/paid by the member or beneficiary at actual cost of the room stay package. Per DTI FTEB Permit Number 1256, Series of 2019.